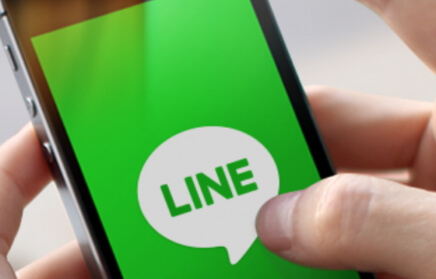 If you are an iPhone user, you might be already using Line as a prominent method of communicating. 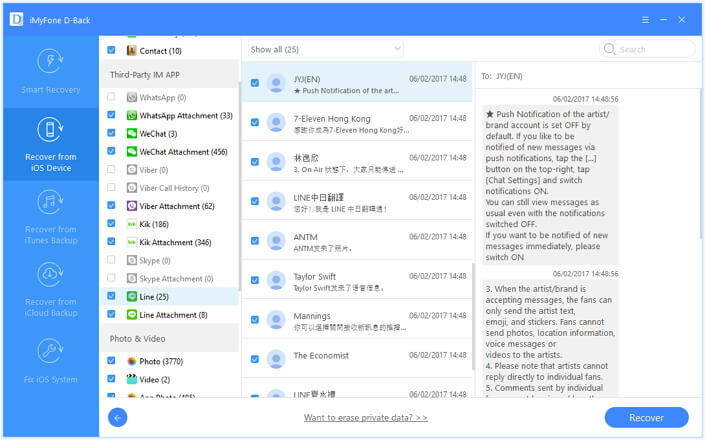 Some of your data like messages, photos, videos, audios and other files you have received over Line can be too precious to lose. 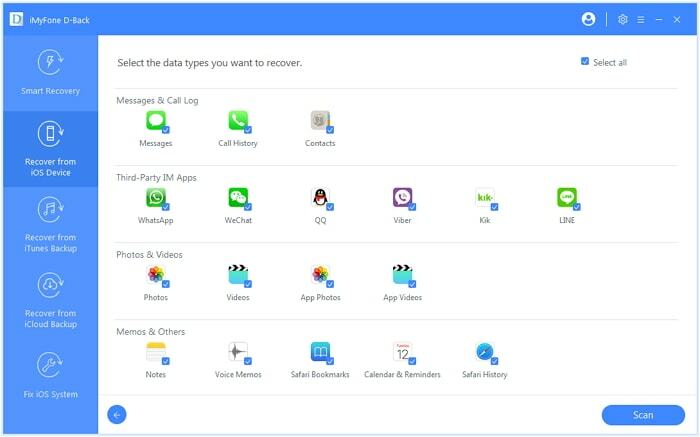 Your Line data can become inaccessible due to numerous reasons, including accidental deletion, virus attacks, software malfunctions, physical damages and etc. In this case, you will have to seek the assistance of a free Line recovery for iPhone. Is There Any Totally Free iPhone Line Data Recovery Tool? We are sorry to tell you that for now there is no totally free iPhone Line data recovery tool. But it does not mean that you cannot recover lost Line data from iPhone. 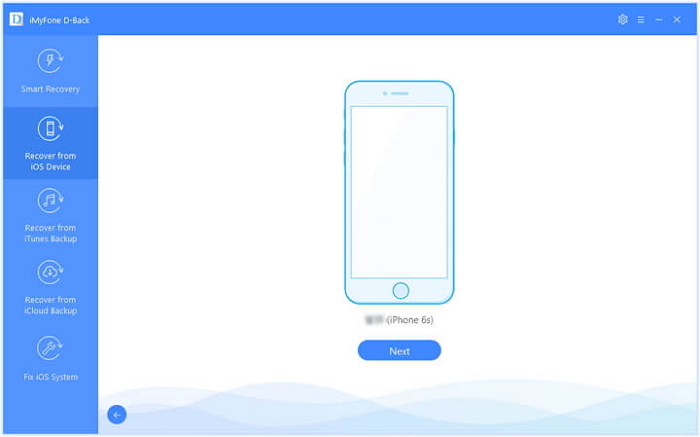 Luckily, we will introduce the best iPhone Line data recovery program which offers the free trial version. The data on iOS devices are usually saved in an SQLite database. If you delete a bundle of data (a file) off an iPhone, the respective data bundle will become “Unallocated” data instead of “Allocated”. But the truth is that the original data remains unchanged within the device itself. In other words, after deleting a file off an iPhone, it doesn’t actually get erased; instead, the identification tag of the file changes. When you save a new bundle of data afterwards, the respective “new” files will occupy the aforesaid “Unallocated” data. Which means, previously deleted files (which aren’t actually erased) will be overwritten whenever you install a new app on the same phone. As a result of that, the deleted data become unrecoverable. So, if you have the intention of recovering lost data from your iPhone, you should strictly avoid installing any app on the device. You also should prevent from saving new files on the device. Activities like downloading files, installation of app, recording videos etc. can reduce the possibility of recovering data. 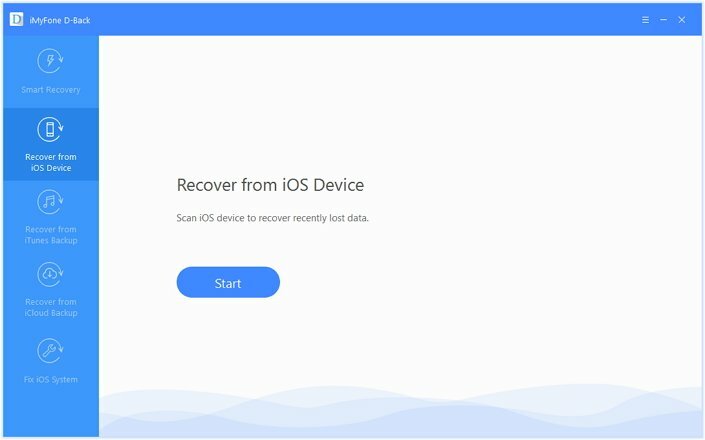 Finding a tool that claims to have the ability of recovering data off your iPhone is not that hard. However, you must be careful when selecting a recovery tool. If you have read the above paragraph carefully, you might understand the risk of trying random tools to recover data. Please read the following if you need to get an insight about a good all-in-one iPhone Line recovery tool. So, we recommend you using a reliable tool like iMyFone D-Back and do your free Line recovery for iPhone. It can recover Line data from iPhone without backups. You can recover Line data selectively or fully you want. It can recover Line data without restoring iTunes or iCloud backup. You are allowed to view the Line data stored in your iTunes and iCloud backup. It will no affect current data on your device. It works perfectly with all the iOS devices and iOS versions. Here’s how to recover Line data from iPhone directly with no backup and no data loss. Step 1.Launch the software and start with “Recovery from iOS Device” option. Then, go to “Start” menu. Step 2.Connect the iOS device to computer and let D-Back identifies your device after trusting. Click “Next”. Step 3.Select the file you intend to recover (for instance, “Line” under “Third-party IM App”) and hit “Scan”. Step 4.After scanning, you will view the recoverable data. You can go to “Show only deleted files” to recover deleted ones. If not, you can click on all the tabs to check everything. Then, select “Recover” and proceed. Define a location to save recovered files and wait for the process to complete. 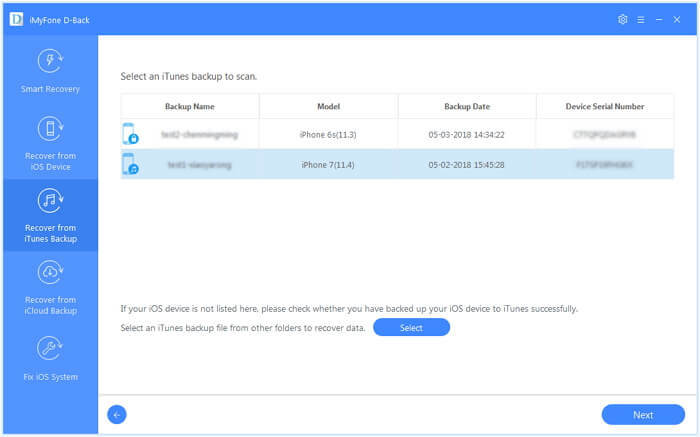 If your Line data has been backed up to iTunes, you can view and recover it from the iTunes backup without restoring and losing data. Step 1. Open the program, go to “Recover from iTunes Backup” and click on “Start”. Step 2. Find the iTunes backup in which your Line data may exist and press “Next”. Step 3. Define the type of the file and go to “Scan” option. Step 4. Once the results are displayed, you can choose what you need and click on “Recover”. Specify a folder to save them. 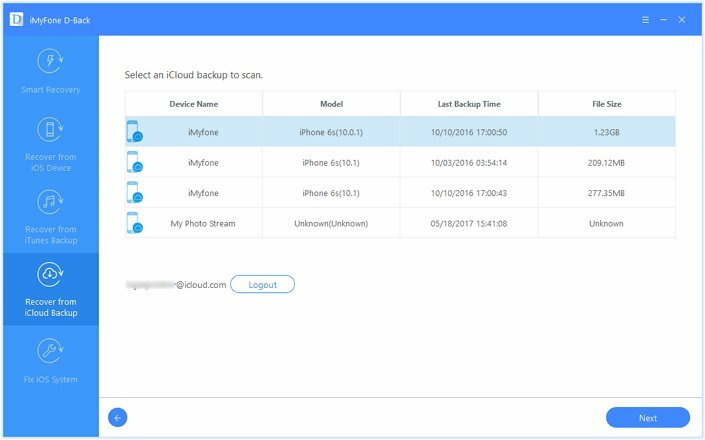 As long as your Line data are backed up with iCloud, you can try recover it from iCloud backup selectively with no data loss. Step 1. 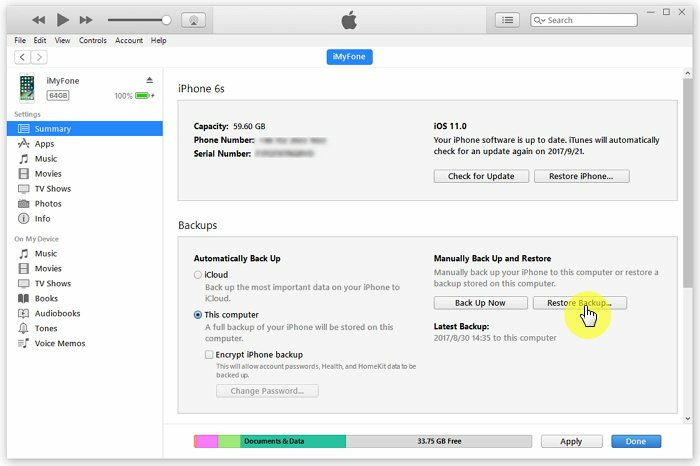 Launch D-Back and click on “Recover from iCloud Backup” and click “Start”. Step 2. Provide iCloud credentials related to the account synced with your iOS device. Step 3. 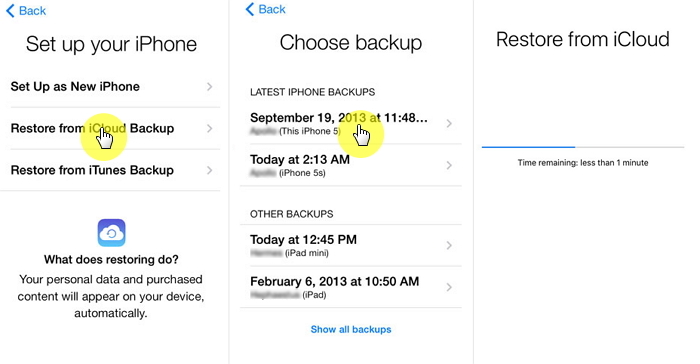 D-Back will search for the iCloud backups in your account. Be sure to select the one where the Line data is and tap “Next”. Step 4. Click on the Lien data type and tap “Scan” option. Wait for a couple of minutes. Step 5. Once the scan is done, you can see the results. Preview the files and specify what you need to recover. Click on “Recover”. To complete the process, define a folder location to save them. Here are two ways to perform free Line recovery for iPhone. Both of these methods are official ways offered by Apple. Please note that using these methods will cause current data loss on your device and you can only fully restore the backup without viewing the content in advance. Here’s the first official free iPhone Line restore method. Step 1. Launch iTunes on the computer where you have backup files. Step 2. Connect the iPhone to the computer and opt to “trust” the computer. Step 3. Choose your iOS device. Step 4. Click on “Restore Backups”. Step 5. Choose the correct backup and hit “Restore”. Here you can try to restore iCloud backup for free which includes your Line data. Step 1. Go to Settings, General and “Erase all Content and Settings”. Step 2. Provide your iCloud credentials and wait. Step 3. Go to Apps & Data Screen. Tap on “Restore from iCloud Backup”. Step 4. Choose a backup to restore. Step 5. When prompted, you need provide the credentials of your Apple account. Stay connected until the process completes. You can try any of the methods we have mentioned to recover your Line data. Just go through the instructions once again and decide which is the best option addresses your situation. We appreciate if you can let us know how it went with the method you chose. Please leave us a comment below.